The International Generation Games Association, based in Lausanne, Switzerland, is a non-profit organization. Sharing the creative concept with communities around the world. Enabling cities to organize an edition of this positive sport for all event. We believe in the positive community impact of the Generation Games. We are fully committed to help solving important issues. That’s why we are focused on realizing valuable experiences for present generations and positive legacies for future generations. The Generation Games has the ambition to matter, to be of relevance. We are committed to contributing to several of the Sustainable Development Goals: #3 (good health and well-being), #10 (reducing inequalities), #4 (quality education) and #11 (sustainable cities and communities). The team is actually formed by the hundreds of people around the world, playing a role in the Generation Games. Volunteers of all ages and backgrounds, putting in their time, energy and enthusiasm. This is truly priceless. And behind the scene, a small team simply provides the framework and creative concept, and assists whenever needed. All of the people and organizations involved in editions worldwide are part of the team! Would you like to contribute to the event, in any way? Please contact us. Various partnerships are possible. Mainly based on volunteerism and in kind collaboration. Sports federations, NGOs, Universities, athletes, companies and many others are closely involved. Providing materials and expertise for Generation Games editions. We are proud and thankful to collaborate with so many committed organizations. 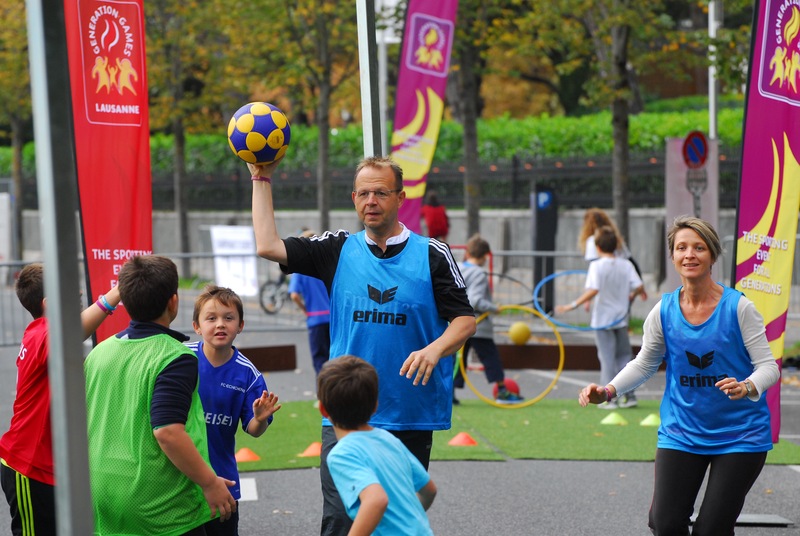 Since 2015, the Generation Games is part of the Olympic Week in Lausanne, which is organized every year in October, by the Olympic Museum. For the Generation Games Rotterdam 2012, EY (Ernst & Young) contributed to the event enabling a clinic by Paralympian Esther Vergeer. And EY supplied materials for a fun sports activity, underlining healthy food. The International Hockey Federation supports the Generation Games in Lausanne with materials. The local hockey club, Stade Lausanne, also plays an active role with volunteers. The FIH also connects with national hockey federations, for editions in other cities. We collaborate with KNKV (Dutch Korfball Federation) in many ways: during editions in Lausanne for example, school edition, etc. We also connect with the IKF (International Korfball Federation). Rotterdam University of Applied Sciences is part of several editions. They involve and collaborate with many partner universities around the world. Enabling students (sport marketing, event management and others) to be part of the Generation Games. Albert Heijn, a large supermarket chain in the Netherlands, supplied the lunches for the participants of the Generation Games school edition in the city of Breda. Inland Norway University of Applied Sciences played a major role in the organization of the edition in Lillehammer. More than 20 students in event management, together with their professors and many organizations in Lillehammer were responsible for the Generation Games in Storgata, the main street of Lillehammer. Would you like to contribute to the event, in any way? Please contact us. Various partnerships are possible. Mainly based on volunteerism and in kind collaboration. Donations are also possible of course.